What’s next for Nashville? Recently, CMT chief Kevin Kay spoke with Deadline about the future of the series. The country music drama is currently in its fifth season overall but its first on CMT. The show was cancelled by its original network, ABC, after season four last year. 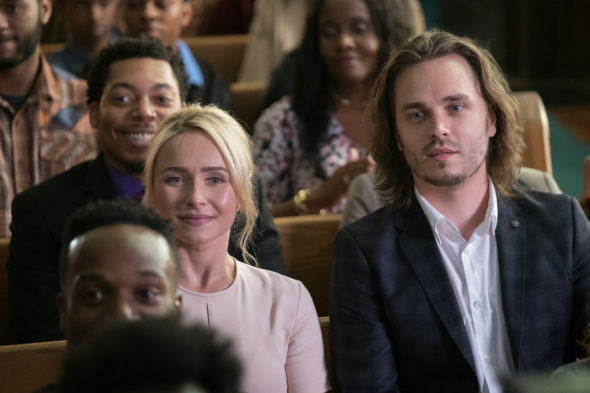 The cast includes Hayden Panettiere, Charles Esten, Clare Bowen, Sam Palladio, Chris Carmack, Jonathan Jackson, Lennon Stella, and Maisy Stella. What do you think? Do you watch Nashville? Will you still watch without Connie Britton? More about: CMT TV shows: canceled or renewed?, Nashville (2012), Nashville (2012): canceled or renewed? Nashville: Connie Britton Leaving in Season Five? I will continue to watch Nashville — if nothing else, for the music, which is very entertaining. Between the acting and the music, Nashville has a very talented troupe. Anyway, when will Juliette’s life turn around? Did she not find a more spiritual foundation after her accident? Can she now be the matriarch of Nashville and doing so with a (meaningful) purpose? I think the storyline has the potential and can still be interesting! I have been a fan since day one and it’s Connie’s loss that she decided to leave this was one of the best seasons yet! I just love hearing the young girls sing and look forward to more to show for them in the future. Country Music to me means FAMILY and this show brings it to me to the fullest! Keep up the good work, writers! Yes I watch Nashville and will continue watching it. Please continue with this show, it’s one of my favorites. I will watch depending what the story lines are. Yes I will continue to watch Nashville. Look forward to seeing the others characters especially Juliet and Avery as they get their personal and professional lives together. All are very talented and entertaining. Yes, I’ll still watch. For me, Rayna was just the hub of the show, not the center of attention. I found other characters, like Juliette and Scarlett, more interesting. Yes, I’ll still watch. For me, Rayna was just the hub of the show, not the center of attention. I found other chracters, like Juliette and scarlett, more interesting. Yes everyone will still watch the show. I loved Rayna and will miss her. But if any show depends on one person for the show to be great then the show was not so great after all. There are plenty of places the show could go with such strong actors. Please keep the show going. Please – keep Nashville going !! We will all miss Rayna, but there are SO MANY other characters and stories that we LOVE !!! More than enough meat on the bone – KEEP NASHVILLE GOING & GOING & GOING !! !